The town of Chincoteague is known worldwide for its wild ponies that were written about in the Marguerite Henry book - Misty of Chincoteague - as well as the movie of the same name. Chincoteague's annual Pony Penning & Auction is a popular event every July. 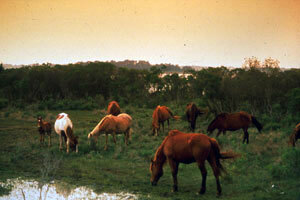 "Saltwater cowboys" herd the ponies from Assateague Island, who then swim across the channel to Chincoteague Island.